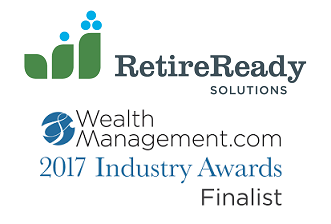 DALLAS, Oregon, September 13, 2017	(Newswire.com) - RetireReady Solutions, formerly Trust Builders, Inc., a leading retirement planning technology solutions developer, has been selected as a finalist for WealthManagement.com’s 2017 Industry Awards. The annual competition recognizes outstanding achievement, innovation, and leadership among companies and organizations that support financial advisor success. The 2017 Executive Forum and Industry Awards ceremony will take place Oct. 11, 2017, at a gala event in New York City. RetireReady Solutions is a finalist in the "401(k) Retirement Plans: Technology" category. The nomination and finalist recognition is related to the firm's flagship software The Retirement Analysis Kit-Online (TRAK-Online), and specifically its plan participant education solutions. These solutions help plan advisers create personalized gap analysis and retirement plan contribution reports for each participant. "We are honored to be selected as a finalist and recognized as a leader in participant engagement solutions," said Edward Dressel, president of RetireReady Solutions. "For over 30 years, RetireReady has believed in advisers and worked hard to equip them to be retirement educators. Our solutions make a difference every day as plan advisers help plan participants get on track for retirement, plan sponsors are satisfied, and advisers grow their business." TRAK-Online's advisor-driven approach directly addresses participants' most pressing concerns. The program produces personalized graphs and calculations that help advisers answer questions such as "Will I be ready to retire?" and "How will increased contributions affect my take-home pay?" "Our company is passionate about improving America's retirement readiness," adds Dressel. "We will continue to innovate and improve on our solutions in order to equip advisers to engage, educate, and motivate their plan participants." RetireReady Solutions (formerly Trust Builders, Inc.) helps advisers build their clients' trust. Founded in 1986 as a retirement investment firm for teachers and other public employees, RetireReady Solutions specializes in retirement modeling, analysis and illustration software for 401(k), 403(b) and federal retirement plan advisers, agents and brokers. RetireReady Solutions is committed to continuously improving its software and to supporting plan advisers with world-class training and support. For more information, visit retireready.com.